You can make these any color combo you prefer to match your party theme, in or outside ~ These pinwheels are perfect lining a walkway or filling a tall vessel. They also make great party favors. 1. To create dual-sided pinwheels, gather double-sided scrapbooking papers in patriotic hues, or if you can't find pages in palette, create your own. Find pages in contrasting patterns, and use the spray adhesive to adhere them together. 2. Cut paper into square shapes — we made 8-inch and 6-inch squares to create pinwheels of varying sizes. 3. Fold squares in half diagonally to create a triangle. Crease. 4. Open the triangle and fold diagonally the opposite way. Crease. 5. Open up the triangle and flatten out the square. 6. Cut along each diagonal fold three-quarters of the way to the center. 7. Pull the tip of every other corner toward the center. Use double-sided tape or white craft glue to adhere the first tip to the center, then each folded-in tip on top of each other. When you finish, you'll have the pinwheel shape. 8. 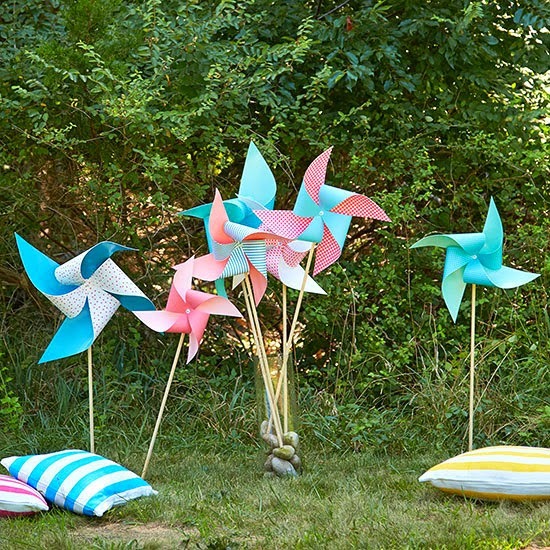 If you want your pinwheel to spin, skip to step 10. If not, simply hot glue the pinwheel to your wooden dowel. Skip cutting down wooden dowels from the hardware or craft store and use inexpensive flag dowels (removing the flags, of course). 9. Finish your pinwheel with a decorative star sticker in the center. 10. If you want your pinwheel to spin, you'll need to push a pin through the center (a straight pin works), then a bead beneath the pinwheel. You'll drive the pin into your dowel with a hammer. If needed, fold over (or cut and then fold over) any part of the pin that sticks through to the back to prevent injuries.